''Regarding customer service here at our Unit we only have good words for SVI and for you so thank you so much for your help!" "It’s always a pleasure to collaborate with SVI. There are not many collaborations getting done as smooth and straight forward as the ones with you." "Finally, your customer service and response time, from such knowledgeable people, are superb and unparalleled in today's world of cutbacks in customer service (I've been in the business for 30+ years). I really can't say enough wonderful things about Huygens and how happy we have been with its software"
"Thank you for the excellent support! I did not expect a phone call from Holland to discuss my application or my emails replied back in almost real time from the other side of the Atlantic; definitely not in August! We sometimes don’t get this kind of support from vendors that are based on the Pacific side of the continent, so this was definitely a huge plus for your software!" "I have been a Huygens user for 8-9 years now and the support provided by you guys are fantastic!'' 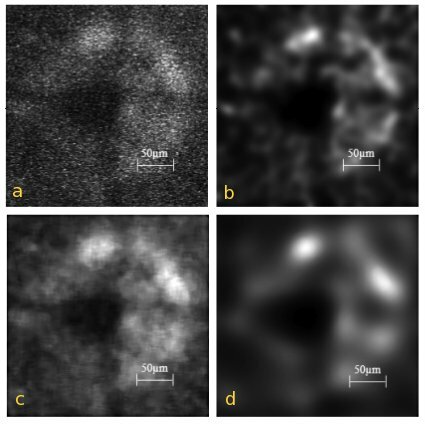 (January 2017)"
"Dr. Thomas Launey (BSI: www.brain.riken.jp):"
"Indeed, the numerous information provided by SVI was extremely useful in solving our issues with confocal imaging and deconvolution. We were able to identify a problem with the z-stepper of our microscope and bring about the required temporary modifications to correct for its deficiency while expecting a routine maintenance exercise to come. With these corrections and the default PSF, our images now have a relative error of less than 3-5% in the z-axis, compared to a previous deformation of 300-400%..."
Dr. James Evans (MIT CSBi, USA): "Because software companies generally respond to researchers' needs, most current imaging limitations occur downstream of acquisition", explains James G. Evans, research scientist at the Computational and Systems Biology Initiative (CSBi). Evans and colleagues are developing an imaging pipeline to collect data directly from microscopes and shuttle this data at high speeds into a database for storage and management, where the data can then be sent for image restoration by deconvolution. To this end, Evans says he has had a lot of success with SVI's Huygens software. "It's very well parallelized, working across many processors, and is almost platform-independent," Evans says. (ref. : MIT CSBi). "I'm 100% happy with the software. In fact, Huygens proved to be highly effective (and cost effective) solution. With correctly measured stacks the results are impressing." is very complete and accurate." "The Huygens Deconvolution Software just makes the images look better. After deconvolution the images are cleaned up (the noise is removed, more details in the image). It is much easier to make a statement with deconvolved images." "Researchers who use Huygens at the facility to enhance their confocal data are very much impressed by the results. I would not have anticipated myself how much especially noisy confocal data can be improved by deconvolution with Huygens. As noisy data is the rule rather than the exception with live samples, we now use Huygens routinely to enhance our spinning disk data." 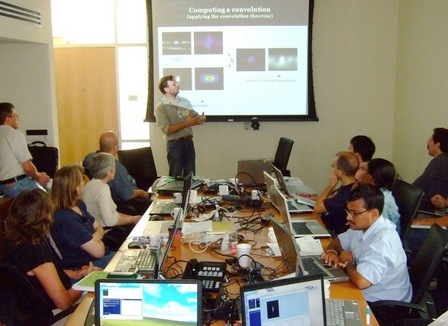 "At our Annual Fluorescence Microscopy Course Live Imaging in 3D course the short training in deconvolution with Huygens was very popular with students and had an addictive quality. Students came back the next day to deconvolve more image stacks. " "Estimating the underlying ﬂuorescence signal: Figure 1(a) is a typical image of the optic disc in the retina of a transgenic mouse where the ﬂuorescence signal is from the GFP protein which, in this case, labels the glial cells. As observed, the image has a very low SNR and this makes it extremely difficult to detect any suitable landmark points and it is clearly inappropriate to use such images as reference images in rank matching. An a-priori estimate is therefore required to accurately estimate the underlying ﬂuorescence signal. We have explored several methods of determining this estimate and found that the Huygens deconvolution method (Huygens Essential Software, Scientific Volume Imaging BV) gives the best results. The deconvolved result of Fig. 1(a) is shown in Fig. 1(b) and as observed, the speckle noise is removed and the ﬂuorescence intensity proﬁle is characterized by various intensity maxima. Conversely, a 9 × 9 median ﬁltering method of estimating the a-priori estimate fails to remove the speckle noise and instead distorts the image as observed in Fig. 1(c). Figure 1(d) shows the results of applying anisotropic diffusion where the noise appears to be removed but at the expense of diffusing the underlying ﬂuorescence signal resulting in the image appearing blurred overall." Fig. 1. (a) Input image, of the GFP signal from the optic disc of the transgenic mouse. (b)–(d) restored image obtained after subjecting the input image to (b) Huygens deconvolution (c) 9 × 9 median ﬁltering and (d) speckle reducing anisotropic diffusion. Quite some scientific papers mention SVI's Software. See a brief list in Huygens References. algorithms without showing one mathematical equation. This was absolutely brilliant. ... This workshop was excellent. ...able to explain physics concepts without using algorithms. This is rare. He gave a small philosophical introduction on reality and truth, which set the tone perfectly for his explanation of image restoration and deconvolution. It was very motivating to hear the explanations on the software. ...the course has been great!!! I'm also much more confident with the Huygens Pro. The tcl command window is really powerful. Thank you again for the hospitality and the well organized course!!! The workshop gave insight into the manifold of possibilities provided by Huygens. I really enjoyed the final session, where we could discuss our individual problems and scientific question with the developers. I enjoyed the course a lot and profited from it!!! The level of the audience was very high and we had a lot of stimulating discussions. This was a highly recommendable course with the aim to help us to optimize the usage of the SVI decon software. I would suggest to try the software beforehand in order to be able to use expertise of Hans, Jose and Edwin during the course. Bring your difficult data along with the results of your decon attempts, and discuss what can be done better.